Fresholi Bites: Embrace The Grit? Something was brought up on the Melting Pot Cafe forum regarding a problem with a lip balm formula containing shea and mango butter. It wasn't the first time this was brought up. So what is the problem? Grittiness. Sometimes, finished products that contain either shea or mango can feel grainy or gritty. It is not usually noticed straight away though as it can take a few days for it to materialise. 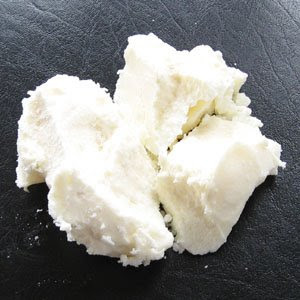 This is because these two butters are both high in unsaponifiables and if heated incorrectly can develop crystal-like granules of fat as they cool and set. Although they do eventually melt upon skin contact (with the assistance of massage), the initial 'grainy' feel can be disappointing, especially when the user is expecting a smooth formulation. But can it be embraced? What about a product that has natural and gentle dispersable exfoliating granules? Great for the lips and wonderful in creams/body butters as no rinsing is required. If that doesn't float your boat and it is a problem, there is a method you could use to either remove or avoid this and restore smoothness. In a double boiler, heat your shea or mango to about 76-85 degrees C (don't worry about spoiling the properties of the butter, this is not hot enough). Maintain this temperature for 15-20 minutes to ensure all fat crystals are completely melted. After 15-20 minutes allow to cool (rapid cooling will reduce the chances of crystals reforming - using a bowl of ice-water will speed the cooling process). This process can be repeated if any crystals reform after cooling and solidifying (can happen if heat is not maintained at right temperature or for long enough).